We’re always telling people just how much potential our amazing students and graduates have, so it’s very exciting for us to see one of our current students win the Shell LiveWIRE Indonesia Business Startup Awards! 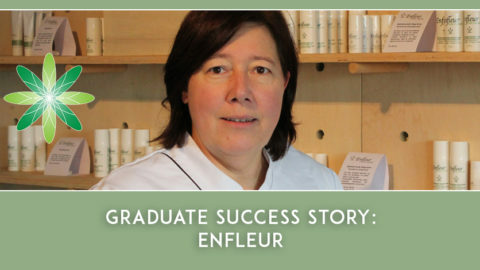 Erika Ernawati Simangunsong has been a student on Formula Botanica’s International Organic Skincare Entrepreneur Program for just over a year and has been running and growing her natural skincare business at the same time. 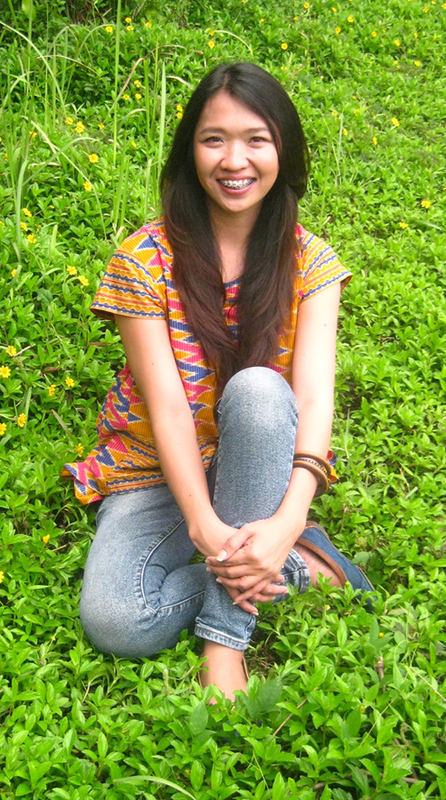 Watch this video to find out more about Erika and her Indonesia-based business, KEYRA. We are SO PROUD of Erika and her lovely business, so we caught up with her recently to find out more. Hi Erika, could you please tell us a bit more about yourself and how you started your business? My name is Erika Simangunsong. I was born in Bogor, West Java – Indonesia and moved to Jakarta to continue my study at the National University of Jakarta with majoring Chemistry. Since I was in the University I had a dream to be an entrepreuner. So although I worked in food industry for 6 years (2 years as R&D Staff and 4 years as Sales Executive), I kept doing several businesses such as food franchise, fashion and cake selling to pursue my dream. But all of those businesses didn’t give the expected result nor satisfaction. I realized it was because I was not passionate enough with the business sectors. And in 2012 I had to close my business and became jobless. During this diffucult time, I struggled to make ends meet and I couldn’t afford the doctor’s fee for my skin treatment. I had allergy with skincare products using chemicals ingredients. At the same time, my father got stroke and had to be hospitalized. Those situations brought me to the lowest point in my life but thankfully I didn’t give up. At the ICU room when I had to accompany my father, I got the idea to make my own natural personal care products. I thought perhaps by using natural personal care products, it would help my skin’s problem and reduce my monthly cost which I usually need to pay the doctor. 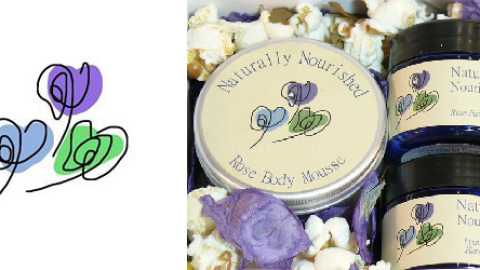 In February 2012, I started learning how to make natural bar soap and made several bar soaps for myself. And it succeed, there is no more skin allergy. Since that time I fall in love with natural skincare. And my friends also loved the soaps that I gave to them as samples and asked me to sell it. 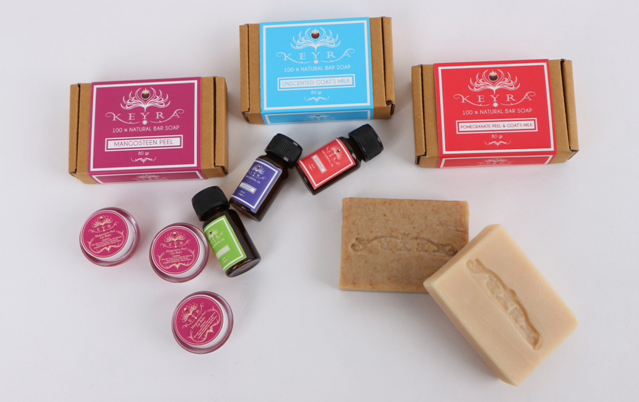 So in February 2013 I launched my brand KEYRA with 5 variants of natural bar soaps. There is always good things behind bad things in our lives as long as we never give up and keep moving forward. Through all those problems, finally I found my passion in natural skincare. Could you tell us a bit more about KEYRA? 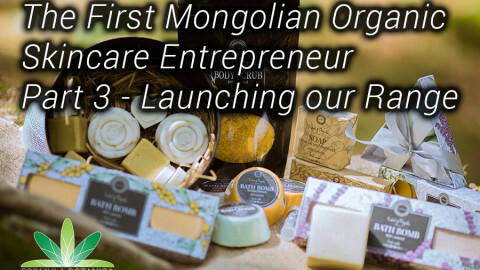 In February 2013 I launched KEYRA with 5 variants of natural bar soap (Mangosteen Peel Soap, Pomegranate Peel Soap, Honey Soap, Blackseed Soap and Red Rice Bran Soap). It is based on KEYRA’s vision to provide natural skincare nationwide and worldwide using local Indonesian extracts as our ingredients. This vision was born after I realize the hidden potential of Indonesia’s natural resources for skin health. One of those hidden potentials happen to be available nearby. KEYRA which is located in Bogor, West Java, Indonesia is surrounded by local goats farmers who still live below the poverty line so they can not support good education for their children. Most of them just breed the goats and sell the meat on Eid Al-Adha, an annual Muslim Holiday. Thus, they do not get regular income to fund their family’s daily needs. The farmers don’t know how to milk the goats and where to sell the milk if they do. It touched me to convert the business concept and became Social Enterprise. So since January 2014, KEYRA became a social enterprise which provide natural skincare products by empowering local goats farmers in Bogor, Indonesia. We provide training and mentoring to the local farmers on how to raise and milk the goats. KEYRA also help them by buying the milk for the soap production. Through this program, I hope KEYRA can help the farmers eliminate poverty and get a better life. In July 2014 KEYRA launched the first line of goats milk products which are Unscented Goat Milk Soap and Pomegranate Peel + Goat Milk Soap. KEYRA is derived from Sanskrit words, Kalyani and Arana. Kalyani means beautiful, and aRAna means plants. Combined together, KEYRA means when beauty meets nature. We believe nature provides a lot of benefits for our skin health, it depends on our willingness to find out about it, nurture it, and use it sustainably. We put mangosteen fruit at the center of our logo to represent our focus in using and exploring local Indonesian ingredients as the raw materials. The logo also use “batik” painting technique to emphasize KEYRA’s identity as Indonesia’s brand. What sort of products do you make and sell? 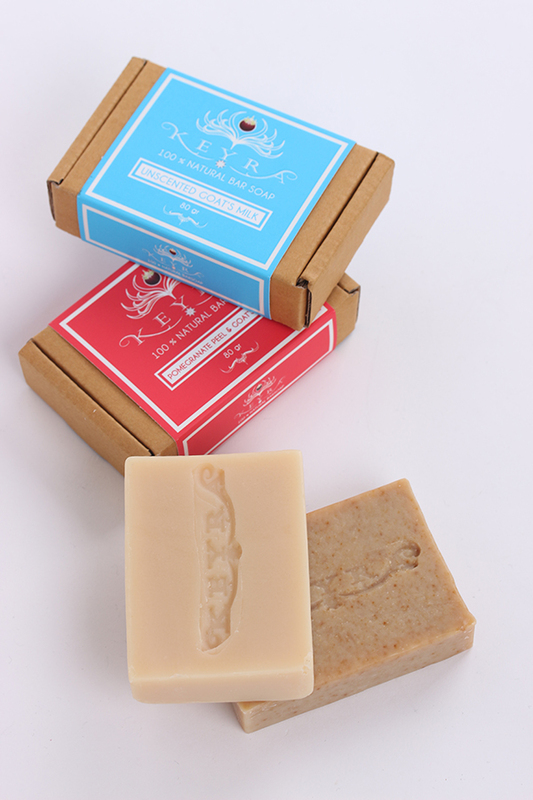 KEYRA has launched Goat Milk Natural Bar Soaps in July 2014. We combined goat milk with local Indonesian extracts such as mangosteen peel extract, pomegranate peel extract and will launch several variants in 2015. I realized if I want to have a wide range of goat milk skincare products, I have to improve my knowledge about it. 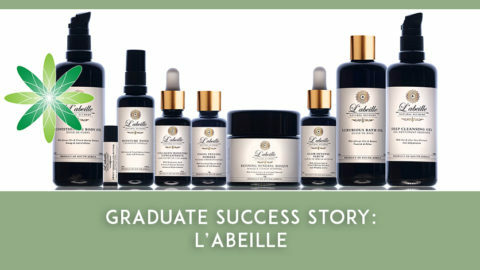 Therefore, I decided to join Formula Botanica, Organic Cosmetic Science School, to level up my business. I am glad to learn here and this experience will help me prepare the new range of goat milk skincare products in 2015. Please tell us about this exciting competition you’ve just won! What was the competition about and what did you win? Late last year, I signed up for Shell LiveWIRE competition, it is a Royal Dutch Shell social investment program, which enables young people to start their own business and create employment. It was started in 1982 in Scotland, UK, and spread around the world. In Indonesia, this is the eight annual Shell LiveWIRE awards which support young enterpreneurs aged 18-32 years old. We introduce our program and vision to prosper with the local goats farmers to the judges and also explained about the benefits of natural skincare products. In November 2014, After a long selection process, KEYRA was announced as one of the winners under “The Most Potential Business” category. Why do you think KEYRA was chosen as a winner? I think the judges chosed KEYRA as one of the Most Potential Business because natural skincare products have a bright future in Indonesia. Furthermore, what makes us different from other brand is our core value which aims to promote local Indonesian ingredients nationwide and worldwide as well as our community empowerment approach towards the local goats farmers. I feel so blessed when KEYRA was announced as the winner and I was the only womanpreneur among the 10 winners. It was priceless experience and this is only a start for KEYRA to expand the natural skincare business. What are your future plans for KEYRA? I am planning to have a wide range natural skincare products using goat milk in hope to be the first goat milk natural skincare in Indonesia. After strengthening our position in Indonesia, I hope to enter the international market. By doing so, I believe we can reach out to more and more goat farmers across Indonesia.